A theater is a player-defined high-level group of command groups. They are typically, but not necessarily, geographical in scope. Alerts such as being in low supply, and a summary of combat progress, are provided for an entire theater, and reinforcement priority can be set for an entire theater. Air and sea region names will also appear below the command theaters to provide alerts such as impending invasions, ongoing sea battles, and enemy air superiority. For example, as Germany, assigning units to Eastern and Western theaters will enable easy evaluation of armies on both fronts. Some players may also wish to use a training theater to exercise Trained units after deployment until they reach the maximum training level with Regular experience and are ready to be reassigned to a combat theater, or a garrison theater to organize partisan suppression and defense of ports and victory points. To create a new theater, if none exist, simply create a new command group (see below). Otherwise, first select a command group. A "New Theater" button will appear. Clicking this creates a new theater and moves the selected group to it. A selected group can be moved to a different theater by right-clicking on the theater. Theaters may be named as desired by clicking on the gear icon to the left of the name (clicking on the existing name is not sufficient). Players may add as many theaters as they like. You can analyze the performance of each theater through the Combat Log, which is opened by clicking on the document icon to the right of the theater name. This displays the results of recent battles. You can filter the data by time (using the slider on the top left) or command group (by toggling the icons with haloes on the top right). With the Together for Victory DLC, the Combat Log also displays equipment losses and analyses performance by template. Caution: The theater interface shows only divisions that are assigned to a command group. Unassigned divisions are shown in the armies list. A command group is a collection of divisions that can be led by a single commander. Each command group is part of a theater, and can be moved to a different theater at will. Command groups allow divisions to be given orders through the battle plans interface, such as assigning to a front and giving a plan of attack, specifying an area to garrison, or giving a fallback line. The commander of each group in the currently selected theatre (or a vague silhouette if it has no commander) appears at the bottom of the screen. If it has one or more attack plans assigned, this portrait will have a button to activate the plans and a sidebar showing the AI's assessment of the plan's value. This is enabled by the WTT DLC. In areas where borders are disputed by neighboring rivals, a player with troops along the border with an opposing state may be offered Border Clashes Decisions costing 100 PP that enables a minimum of one division of its troops on the border of the disputed state to stage an incident at the border. The incident takes 30 days and 100 PP to stage. Completing the incident starts a period during which the staging player can decide whether or not to escalate the incident to a Border Conflict at a cost of 200 PP - if not, the incident is forgotten (but another incident cannot be staged against the same target within 180 days of the start date of the earlier staging). If escalated to a Border Conflict, a low intensity combat is fought between the committed troops for a period of one year unless one side or the other wins first. Make sure to use special effects such as Force Attack to buff the troops immediately before the timer ticks down to the actual start of the Border Conflict. In a border war, the frontage is 80 (subject to modifiers) and both sides can get up to 80 width of troops in combat by sending them to the frontier. The game selects the troops committed from nearby and chooses the commander for the conflict. The player can observe but not control or stop the border conflict once under way, although troops can be added if less than the full combat width was committed at the start of combat. If the relative strengths are very unequal, the conflict can end quickly, so it can be worthwhile to send 80 width of good troops to the border in conflict, fully prepared for combat. A victorious invader gains the disputed state and some PP (e.g., +100 PP in China). In a stalemate, the border remains unchanged, both sides get some Army Experience, and the defender is rewarded with substantial PP for holding on. A defender that defeats the invader gains additional PP, Army Experience, and Land Doctrine research bonus as a reward. A failed invader must wait for a time before trying again. There are Decisions for the attacker and defender to choose to escalate the scope of fighting one step further to allow adding troops and taking things a step closer to full war. Lend-lease is only availabe for countries in a full war, so is not available based on just a border war. The vanilla game is configured to limit opposing countries to one border conflict at a time between them. Troops can be transported across water and between two friendly ports. When a division is standing at a port, simply right-click another port to have them attempt to transport themselves there. Transporting troops requires convoys and if the country and its allies do not have naval supremacy over the sea region, they may be intercepted resulting in casualties. If a division is not standing in a port, right clicking on the port province, then shift-clicking on the destination port symbol will allow it to be transported in a single order. Alternatively a battle planner command like garrison will automatically move a unit across an ocean tile if there is no accessible land path to the target and enough convoys are available to transport the unit. To launch a naval invasion, the battle planner needs to be used. The Naval Invasion order is the first one on the left. First a naval base is determined as starting point, then the coastal province(s) where the invasion should take place. Naval supremacy is required in all of the sea zones crossed for the invasion. The plan then needs to be prepared for a number of days which is a function of the distance traveled during the invasion and the number of divisions added to the invasion. The shortest invasion preparation in 1936 is 7 days using 1 division across 1 sea tile. The naval technology Transport Ship is required to assign divisions to a naval invasion. A naval invasion cannot start unless the commander has enough reconnaissance information about the sea zones the divisions will be travelling through. Gathering this information requires fleets to be assigned to missions (other than Hold) in those zones, or air wings to be assigned to missions in the corresponding air zones. There is a limit to the number of divisions that a single country may assign to naval invasions at one time. With the basic Transport Ship technology only 10 divisions can plan an invasion at once; with Landing Craft this increases to 50. Multiple invasion plans can be set up from a single command group; each plan must start from a different port. An army can also move into friendly territory using an invasion, but it is more efficient to simply use port-to-port movement as described above. For land unit base stats reference base stats. For land unit combat stats reference combat stats. Combat tactics are chosen at the start of combat and changed every 24 hours. The Reconnaissance stat affects the selection of the combat tactic where a higher stat increases the chances to counter the tactic chosen by the enemy. Combat is resolved in one hour turns, where both the attacking and defending divisions each randomly choose an opposing division to fight against this turn. In the following we refer to as the "attacker" the side who is on the offensive and initiated the combat and as "defender" the side which was attacked. A specific attacking and defending unit then depends on the combat phase and can refer to unit on either side. The combat widths of each division in a battle are added together to determine how many of those divisions will fit into the width of the frontline and fight. The available width of the combat is increased when attacks on the province come from multiple directions, so tactical flanking is needed to leverage a numerical advantage if the battlefield width is a limiting factor. Width is also affected by certain combat tactics. Base battlefield width for combat is 80, where additional directions bring 40 extra per direction. The combat width of a division is the sum of the widths of the battalions it contains. Infantry, (including motorised, mechanized and special forces), tank and tank destroyer battalions have a combat width of 2, artillery and self-propelled gun (SPG) battalions have a combat width of 3 and anti-tank, anti-air and self-propelled anti-air battalions have a combat width of 1. Support companies occupy no combat width. The Vast Offensives and Human Wave Offensive technologies from mutually exclusive branches of the Mass Assault doctrine tree reduce the width of ordinary infantry battalions by 0.4, meaning 25% more infantry battalions can fit in the same infantry frontage. 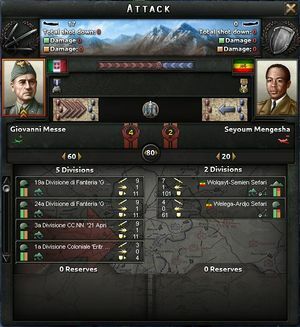 Divisions that do not fit the combat width or that join the combat after it has already started end up in reserves. While in reserve, these units do not contribute to the battle in any way, do not regain organization and do not increase their entrenchment or preparation bonuses. Units in reserve have a chance to join combat every hour as long as there is combat width available. The base chance to join is only 2% per hour (so mean time to join is about 35 hours). This chance is greatly improved by having Radio researched, by division speed, doctrine tech, and having a signals company attached to the division. When defending, if all frontline divisions retreat while there are still reserves available, the reserves are forced to retreat as well. Same for attacking—the attack stops if all frontline divisions run out of organization even if there are fresh reserves available. As a defender, try providing reserves in a timely manner so they have time to reinforce the frontline and are not forced to retreat and potentially be overrun. If fighting at full width with fresh reserves, consider manually retreating your defending units that are very low on organization one at a time one province away from the front so they can recover and reserves can fill in. Otherwise you run a risk that all frontline troops get low on organization and retreat at the same time, giving reserves no chance to reinforce. If you are on the attacking side, consider not attacking with more units than can fit into combat width so that rest, instead of waiting in reserve, can recover organization and gain the planning bonus. When you do have reserves and width available (if they caught up, or a division runs out of organization) and all defender units are already fighting, instead of waiting for reinforcement it can be useful to stop the combat and attack again so all your units join immediately. Soft attacks and Hard attacks give the number of attacks against a defending division. The Hardness stat of the defending division determines the proportion of soft and hard attacks the division receives: For example, a division with 100% Hardness receives all Hard attacks and none of the Soft attacks and a division unit with 25% Hardness would receive 25% of the Hard attacks and 75% of the Soft attacks. If the attacking division has lower piercing value when compared to defenders armor value, only half of the attacks are used. The number of attacks is compared to number of defenses of the defending division before calculating the possible damage, see following section on Damage dealing. The attacker's Breakthrough values are used to determine how many defenses each of the attackers' units has. This is compared to the defenders' units hard and soft attacks to evaluate damage done to the attackers' units. The defender's Defense values are used to determine how many defenses each of the defenders' units has. This is compared to attackers' units hard and soft attacks to evaluate the damage done to the defenders' units. In damage dealing the number of attacks is round(hardness modified attack / 10) and the number of defenses is round(defense / 10) (round(x) is random and defined as round(x) = ⌊x⌋ + Bernoulli(x - ⌊x⌋)). Both are integers. Each attack has the potential to be a hit or miss, where hits would cause HP and organization damage to the enemy unit. After each attack, the defending unit removes one defense (if it has some left) and the actual chance to hit depends on if the defender has defenses left or not. The base chance to avoid hit when unit has defenses left is 90%. If the defending unit has exhausted all of its defenses, the chance to avoid hits drops to 60%. For each hit the amount of possible damage done is random, where a "dice" is used to randomly choose the amount of damage done. For HP damage the size of the dice is 2 and for organization damage it is 4. The exact amount of damage done to HP and organization per hit is calculated by multiplying the obtained random integers and damage modifiers (the 0.05 base modifier, damage modifiers in tactics, -50% armor deflection factor when the armor value is greater than the opponent's piercing). Other modifiers affect the number of attacks thus the number of hits but not the amount of resulting damage per hit. When armored units are in combat against targets with lower piercing, the organization dice size is increased to 6 representing the ability of the armored unit to deal more damage. The damage done to unit's HP reduces its manpower and equipment proportionally by HP loss%, in addition to equipment loss from attrition. The fighting strength of the unit is the minimum between the ratios of manpower and equipment IC. A unit's damage output is scaled by its fighting strength. The scaling is rounded to multiples of 10% , e.g. for strength less than 100% but greater or equal to 90%, the damage output is scaled by 90%. Note that damage done to unit's HP does not change the other stats of the unit before the combat is finished. To summarize the above with an example: an armored division with 1000 soft attack vs an infantry division with 500 defense. 50 attacks against defense; 50 attacks against no defense. 50 attacks have 1 - 90% chance of hitting; 50 attacks have 1 - 60% chance of hitting. On average, the infantry division is hit 50 * 0.1 + 50 * 0.4 = 25 times. For 25 organization dice rolls, (1 + 6) / 2 = 3.5 per roll is expected. The armored division is damaged to slightly less than 100% strength thus has a 90% damage scaling factor. In total, the armored division is expected to deal 25 * 3.5 * 90% * 0.05 = 3.9 damage per hour. For a regular infantry division with 50-60 organization the combat is expected to finish in about half a day. Terrain: base penalties for attacker -20% in a forest, -30% in hills, -60% in mountains. Fort: penalty for attacker attack and breakthrough of -15% per fort level. Each extra attacking direction cancels out one fort level but not the last level. Enemy air superiority: penalty for defender defense or attacker breakthrough. penalty = enemy air superiority * (1 + enemy doctrine modifiers + terrain modifier + concealment advisor) * -0.35 + 0.7 * AA / (AA + 112) (the latter part is "enemy air superiority reduction"). Exceeding combat width penalty: divisions in active combat can slightly exceed allowed combat width with a small penalty to offset this (-2% per extra combat width). Stacking penalty for having too many divisions in combat: (-2% per division over the stacking limit. The stacking limit is 8, plus 4 per flanking direction. Paradrop penalty: -30% combat penalty 48 hours after being paradropped. All positive factors stack with each other multiplicatively, so it is possible to reach very high values in a very good tactical situation. The final factor is capped at 1% if the multiplied value is lower. During combat, the ratios of equipment and manpower losses are updated to 70% of the loss in strength ratio. The stats of the unit are locked during the combat if the template is unchanged, and are updated after the combat. Gives chance of equipment loss every day. Reference Attrition. This page was last edited on 5 April 2019, at 09:28.